Is Mancini the man to succeed at Manchester City? Roberto Mancini's men failed to impress with another 0-0 draw against Birmingham City on Saturday. Money can't buy you love, and it can't buy you trophies either, especially when you have the wrong man calling the shots. Manchester City, who suffered another misfiring moment at the weekend, are about as likely to win silverware with Roberto Mancini sat in their dugout as pigs suddenly mastering the art of flight. Boos greeted the players and the manager at the City of Manchester Stadium as the final whistle sounded following a 0-0 draw with Birmingham on Saturday. Another poor performance at home frustrated the supporters. That's three straight scoreless games in front of their own fans, part of a run which has seen the most expensively assembled team in England win only one of their last five league matches. You would expect Mancini to express some concern, but after the clash he said he didn't feel any pressure from the media and dismissed any speculation about his future as trivial, especially at this point of the season. Was this a defense mechanism perhaps? Well if it was, it was certainly a bad one. What most fans would expect from their manager after another poor performance would be a sense of urgency and a few passionate words of inspiration. The problem is Mancini is not that kind of man. He never was, and he never will be, and that's the reason why the Italian coach won't be able to get the best out of this group of players who earn too much to care about every game and performance without motivation from their manager. Mancini has clashed with the likes of Craig Bellamy and Carlos Tevez in the past and will continue to struggle to cope with the more charismatic characters in the dressing room. His distant and detached style of management may work with many members of the squad, but it won't sit well with the ones who lead by example and expect the same from their boss. If his management style hasn't been ideal, then Mancini's squad rotation policy has also failed. In an attempt to keep his players happy, he has often changed his line-up and tactics. Europa League games have served to give some of the higher-profile substitutes a chance to shine, but it has come at a cost. The team hasn't blended as well as it should by now and continues to struggle to find its identity. Instead of rotation, he should have sought consolidation. Look at what Jose Mourinho has done at Real Madrid. He has fielded a largely unchanged starting eleven through the first 15 games of the season. The likes of Karim Benzema, Lassana Diarra and Raul Albiol may be pouting on the bench, but the team is winning. He has worked mainly with a core group of players, inspired them and given them an identity. When the time comes that Mourinho feels his tactics and philosophy have been assimilated, he will change his line-up. But for now, there are bigger fish to fry. Curiously, Mourinho would be one of the few managers capable of winning trophies in the short term at City. Mancini may not be the right man for the job, but there aren't too many coaches who would fit the bill. So what is the solution? Well the directors at the club are in a no-win situation at present. Firing their manager mid-season would be counter productive. It would create even more confusion. Furthermore, whoever came in wouldn't have the time or the space to be successful. Mancini will most probably stay until the end of the season. At that point, even if he secures European Champions League football, he should be let go, and a stronger, more passionate leader should be brought in. Fancy a new challenge, Mr. Mourinho? When will it end Mr.Pinto? Mourinho inherited his team at Real, the hard work and experimentation had been done by his predecessor. He is a great manager, but he merely had to fine tune, while Mancini inherited a work in progress so he has to chop and change to achieve his best line up. Should he not be allowed the time to do that? According to you, no. You wrote a few weeks ago in reference to a lack of player loyalty that " I would also be in favor of introducing a law that would oblige all players and clubs to commit to three-year contracts. So when a club signs someone, they are stuck with him for three years. "...Do you think it might be fair that a loyalty clause should also be applied to a manager to give him time to build a succesful team?...Mancini has not had a smooth ride to so far, but his team is 4th in the table, which is still in the hunt. Your Roberto Mancini obituary is premature with just 13 games of the season gone. i think, well CNN is a 24hr channel and it so happens that Pinto watches his own newscast when he gets home and starts believing in what he says. Fortunately for the rest of us, Pinto cant afford a controlling stake in a big soccer club otherwise he would have hired and fired as much as he opens his mouth to read the news. Yes, Mancini is a good professional - so, in any team's life it happens the bad moments - in these kind of moments you can measure the quality of the couch and players. I would like the writer of this article to know that Raul Albiol was traded to Schlake in Germany. He is not on Real Madrid anymore. The Italian defensive style simply does not work in the EPL. I was always against the sacking of Sparky as in particular, he had the ability to also get a top 5 finish. Mancini is certainly a great manager but it is clear that although he has inherited or bought lots of strike power, he clearly seems to be trying to build from the defence up. One of the problems he is encountering is that wilth all this money City are spending and have in reserves, it appears that most of the new players at CIty are there because of the money. Sure the players would rather win trophies but i question their desire to fight to the bitter end and really get their hands dirty. They all seemed happy to sign for Mancini and therefore should have faith in his tactics but of course the high fees being paid place lots of pressure on the players so it is obvious the players would pass the buck and blame the tactics. It is true that the tactics do seem to be defensive but we all saw what happened with Newcastle under Keegan. A team needs a great defence but the way City are set up, clearly shows that Mancini is being too defensive in his tactics. When it gets to 75 minutes, if City are 0-0 then Mancini resigns himself to shutting up shop as he feels 1 point is better than none. Hello, Pedro Pinto, I will not read you post. However, Roberto Mancin, coach of Manchester City is a disaster. City deserves a better coach from January. Mancini is starting from scratch, and Pedro's expecting a miracle??? 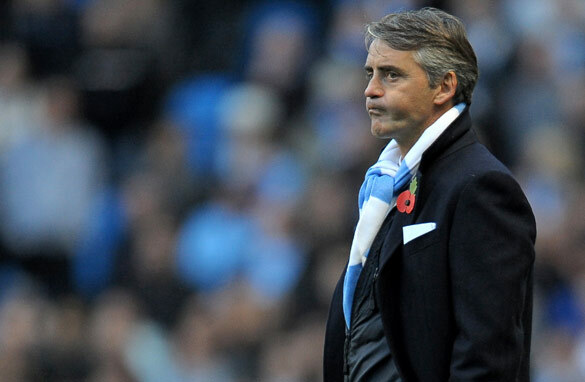 Try putting Fergie or Mourinho in Mancini's position, could he do it? against all odds i still believe in Mancini... rome was not built in aday so try let him be. i dont think u, pedro Pinto is the be analyst yet poeple give u a say. why not let his employees decide whats best for their club not 4getting liverpool, arsenal and manchester united all with personal problems. Hi i would like to see more sports beside Football. I know this Europe ,but you have alots of Americain that live here and would like to see more Basketball highlights Americain football ect.. I know Cnn show it but only a few second and then the main show is about Europe football. If you want American Football go back to the States. Football Football is the universal sport. The cost of one American football helmet can buy a full set of Football uniforms. Give me a break, more NFL coverage in Europe. Mike are you CNN if not your comment means nothing to me and i would appreciate if you keep your mouth closed. If Mancini Wants 2 Succed In City He Must Tell City Players 2 Try More Than Ever Before,If Mancini Wants 2 Succed He Must Have A Very Good Relasionship With The City Players 2.If Mancini Does Do That I Promise Mancini And Man City Will Succed. man city should get a better coach for there self.if not ,it will be too late for them. Congratulations to FIFA, bringing to developing economies a fair play. been of high charisma;i think he is the man of the moment.seeing the determining wins he has recorded this season.he takes points against former teams of the top four,which is very much important for any ambitous team in the league.